Members of the AZUR Development organization are all-too familiar with the stigma and discrimination that those with HIV and AIDS face in Congo. They witness it firsthand through the organization's various projects, from hosting radio programs and blogging to compiling reports on those with HIV/AIDS. There are 79,000 people (or 3.5 percent of all adults) in Congo living with HIV/AIDS. 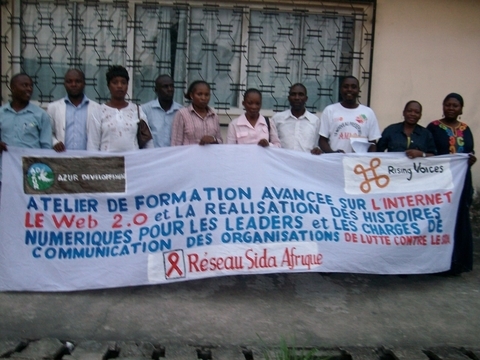 AZUR Development's AIDS Rights Congo project, funded through a Rising Voices grant, is working on documenting the stigma and discrimination that these people face. They are doing this in part by posting stories of their experiences on a blog. Through the project, communication officers and leaders of local HIV and AIDS organizations have also been trained in digital story telling, podcasting, and blogging. Each communication officer is using these newfound skills to share stories of how HIV/AIDS is affecting the local community where he or she works. Citizen media training session for communication officers and leaders of local HIV and AIDS organizations. The latest posts on the project's blog reflect how different segments of Congo's HIV-positive community have been impacted by the stigma that accompanies having the disease. A few of the posts focus specifically on women, who make up 59 percent of those living with HIV/AIDS in Congo. For example, a post by Dieudonnée Blandine Louzolo, AZUR Development's Communication Assistant, discusses how the quality of health care is compromised for HIV-positive women. Though HIV/AIDS services have been expanded in the city of Pointe-Noire, the negative attitude of health professionals still poses an obstacle to these women getting proper care. It's a catch 22 for many of these women: they're encouraged to get tested for HIV, but if they test positive they often pay a price. The post elaborates on how this applies to pregnant women. Health professionals working at hospitals, who should be providing moral and psychological support for the patient, are leaving women at birthing beds as they fear HIV infection; thus some recommendations of ethics are no longer fulfilled. An HIV-positive woman lost her baby during childbirth at a hospital in Pointe-Noire because she was HIV positive and no midwife wanted to touch her. Many of them after treatment with PMTCT [Program for Prevention of Mother to Child] are abandoned… Another HIV-positive pregnant woman was saved by a midwife trainee, although her child died after birth; again in this case the midwife feared infection. …Rejection, reluctance, and the abandonment of women infected with HIV continues. AIDS activists should act to stop such discrimination, which violates the right to health care for HIV-positive women. Called pygmies, the indigenous people in the province of Lékoumou live in extreme poverty and away from the majority of the population (the Bantu). They live in huts, surviving thanks to the products of hunting and gathering in the forests. Pygmies have little access to education and basic social services. They are discriminated against by the Bantu people, who generally consider themselves superior to pygmies. Many pygmy women and men serve as cheap labor for the Bantu people. But when HIV/AIDS gets involved, it further complicates an already precarious situation. Indigenous women are also vulnerable to HIV/AIDS and doubly stigmatized…. …When they come for the first consultation at the hospital in Sibiti, after testing HIV positive, indigenous women do not usually return. That’s understandable. Who will pay for transportation, meals and to stay in Sibiti so they might hopefully survive HIV/AIDS? The answer is easy to find: nobody! Already regarded as ‘less than nothing’ by some Bantu people, it is difficult to imagine that they can look at them. AZUR Development and ACIP wanted to create something new, implementing a project to train HIV-positive indigenous and Bantu women to take care of themselves and their peers. HIV-positive women aren't the only ones being stigmatized though. Dieudonnée Blandine Louzolo also discusses how having HIV/AIDS can affect prisoners in Congo. The post shares a story about a male prisoner in Pointe-Noire and how his and other prisoner's stories reflect the need to advocate for the rights of those living with HIV/AIDS, rather than just focusing on prevention. At Pointe-Noire, Congo, a HIV-positive married man and father was released from prison when the police became aware of his HIV status. The deep meaning of his story must be analyzed. We will never tire of saying that HIV/AIDS continues to be a subject of controversy and stigma even in police stations. An HIV-positive man who had committed an offence was jailed at the police station in his neighborhood and was waiting for the outcome of the procedure that was underway. He was released because the policemen feared that he would infect other prisoners. ‘This is not content that we used to listen to,’ said listeners. Herman Malanda, CJESS Coordinator and host of the radio programme, said that the listeners were surprised and interested in the programs. SMS and calls were made requesting more information on AIDS treatment and how people could live with HIV. What was interesting about these radio programmes is that they have broken the taboo and helped deal with the lack of information on how a family can care for a person infected with HIV. We often hear that parents don’t want to spend their money on an HIV-positive person, since the person is regarded as ‘dying’ and therefore there's no need to waste their time. These radio programmes therefore are aimed at educating families about the fact that living with HIV is not a crime and everyone should be loved. Solidarity should be shown for people living with HIV. The organization plans to run other radio programs in the future on focused on HIV/AIDS and violence against women and girls. Following the deteriorating situation in east Congo, the MJPC called for the Congolese Government to pay the salaries of thousands of soldiers who have not been paid for over six months in east Congo, take swift action to enforce the International Criminal Court’s (ICC) warrant against Bosco Ntaganda and to hold accountable perpetrators of sexual violence against women for their acts. the Mobilization for Justice and Peace in the DR Congo (MJPC). Mr. Sekombo again criticized the government of Congo for not only the continuing failure to protect women and young girls from sexual violence, but also for “encouraging conditions that create opportunities for sexual violence to occur”. “There is no excuse for missing to pay salaries to soldiers in lawless eastern Congo for six months” said Sekombo. MJPC is a nonprofit organization dedicated to working to add a voice in the promotion of justice and peace in the Democratic Republic of the Congo in particular in the East where thousands of innocent civilians, including children and women continue to be victims of massive human rights violations while the armed groups responsible for these crimes remain unpunished.